We have learned several label animation methods, through last few Posts dedicated to this topic, but we will try another trick, with the last design that you have created to try out the Zoom-in method. In this method we will play with colors and each letter of the name is applied with different color generated randomly. Besides that, the name of the employee is plotted in a magical way by displaying odd numbered letters first in odd numbered labels i.e. lbl01, lbl03, lbl05 and even numbered letters displayed in even numbered labels i.e. lbl02, lbl04, lbl06 and so on. The letters will be plotted on the labels in a fixed time interval giving it an animated effect. 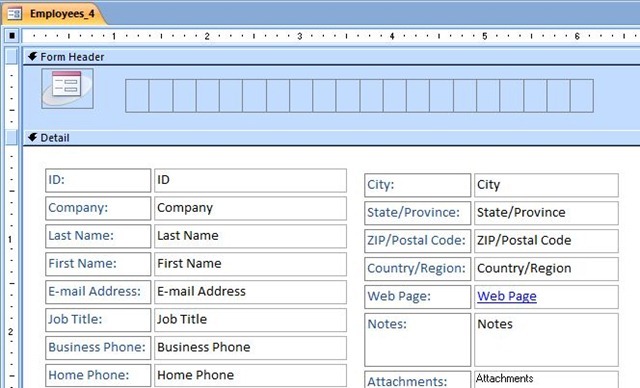 After these two step action only the employee name display will be completed on the Header of the Form to view. You can easily implement this method if you have tried out the earlier label animation method we have seen last week. 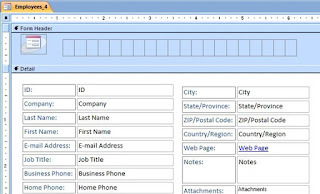 Make a Copy of the Employees Form, we have designed last week, and name it as Employees_2 or any other name you prefer. Display the Code Module of the Form (View - -> Code), after opening the Form in Design View. Copy and Paste the following VBA Code into the Form Module overwriting the existing Code. Save the Form with the new VBA Code. Use the record Navigation button to move the record forward or back and watch how the employee name is displayed in the header labels. Each character of the name will be displayed in different colors and in one tenth of a milli-second's time interval, giving it an animated effect. The color codes are generated randomly. 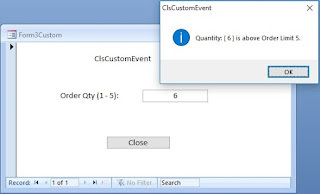 In this control program we have used two delay loops, instead of using the Form's default Timer Interval Event Procedure. You can modify the given value 0.1 in the program line Do While Timer < t + 0.1 to increase or decrease the animation speed. For example: The value 0.5 will slow down the action and 0.05 will run faster.